The only fresh milk one touch cappuccino solution that eliminates cleaning and sanitation needs thanks to disposable milk frothers. An industries first. allowing users the freedom to multitask. stainless steel wands, milk doesn’t bake onto the wand. 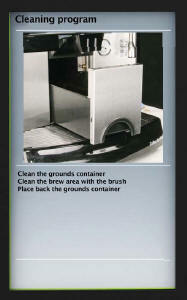 • Milk residue easily wipes clean, even later on after steaming. • Steams 32oz (1Ltr) of milk in 1 minute. 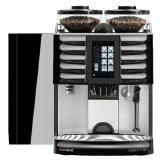 • The typical espresso beverage contains more milk than espresso. • Automated cleaning system with minimal staff attendance. machine will auto fill to the correct level. 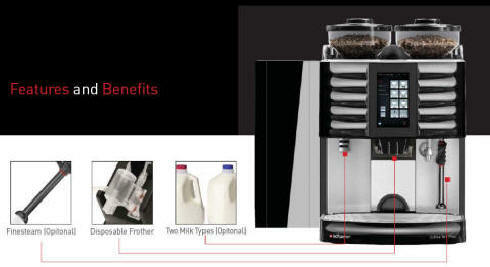 • Delivers 16oz lattes and cappuccinos in less than 30 seconds. • 7” touch screen is an easy-to-operate user panel and advertising space rolled into one. • Beautiful crisp display for custom beverage layouts and graphics. • Easy-to-follow animated cleaning instructions. read, recognize and execute file extensions for easy data transfer. • Two bean hoppers with dedicated grinders each hold up to 2.2 lbs.